It’s so easy to become secluded and sit at home, in your own bubble, but it wasn’t until a group of people literally pulled me in with their welcoming atmosphere and demeanor, that I realised that I could function amongst other people as well (even if it was somewhat limited). To understand my bubble, you need to also know a little about me, or rather, about my childhood. I had a less than ideal childhood. I have a great family, lived in a great house, even in the “best country in the world” as they say. And despite this, I say I wasn’t happy with my childhood. My school years were the reason, they were rough. At times I think back and feel like events that unfolded were parts of ridiculous scenes from an over the top movie. All in all, the days seemed generic enough, except my school days were a thing of dread. I would suffer physical and verbal abuse throughout my schooldays, even going to and from school, I had no real friends (victim by association is understandably not something a child would want to intentionally walk into. I understand this as an adult, but as a child it’s not that easy). Because of my treatment over the years, I developed trust issues, I got a fear for everyone around me, and it was growing stronger and stronger over the years. I suppressed it, I lied about it, and I got terrifyingly good at the lying part. This is why I was drawn to the internet: I didn’t have to interact with people, I didn’t need to go outside where the others were, I could just do my thing and move on. I could live in my own bubble. But then the darndest thing happened. I’d been stuck on a project, I needed help, and I turned to a support room for an open source project, for WordPress. If you’ve ever tried to get help in a chat before, you’ll know what kind of an experience it can be, the snarky reactions to your code, the nitpicking of using the wrong terminology, it’s not fun. This place though, they didn’t care that I was not only using the wrong terms, but my entire code was a horrible mess. Where I would usually get the help I needed and move on, popping back in my bubble of solitude, I instead wanted to be like these people, I wanted to use what I learnt to let others get helped. Over the years, I all but devote myself to that place. Nobody knew me, I liked staying under the radar, but eventually I got pushed into a team meeting. I was intrigued, so I would watch, I’d say hi, and progressively make my opinions heard. Yet, I would stick to my bubble, once the meeting was over I was back on my own. Until I got to attend my first big WordCamp, the last one held in San Francisco, I was ecstatic! I’d never been to a big conference before, as I didn’t like crowds, but I knew some of the people who would be there. They were people who had been friendly and inviting in the most genuine way imaginable. It’s not easy being worried whenever you’re out amongst people, but this group of people, this community, I didn’t have that fear around them. I somehow made WordCamps my safe space. They are where I can, if only for a short while, leave that bubble, leave the need to be alone, and be a part of something great! I use them as fuel to get through the hard times, I can look forward to meeting people, people who value my opinions and my experience. People who genuinely want to listen and most of all, care about you! The WordPress community is, slowly but surely, helping me get rid of my ingrown fear of the unknown, of others. The community is helping me become myself again. 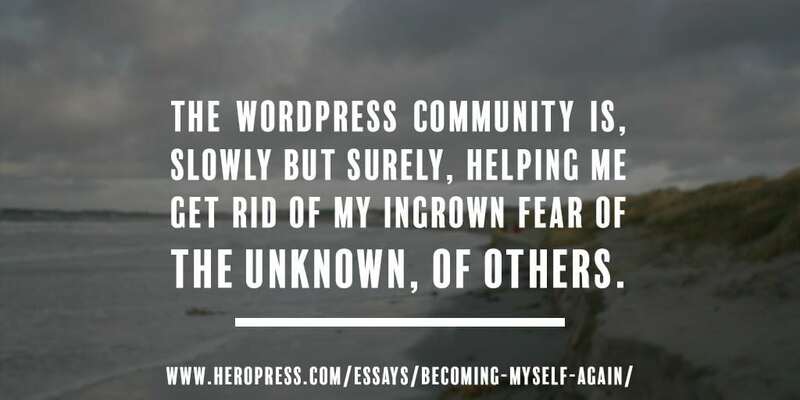 The post Becoming Myself Again appeared first on HeroPress.